The company’s CEO Mark Zuckerberg explained the reason why in a public Q&A held at its headquarters. Facebook CEO Mark Zuckerberg answering question at its public Q&A session. THE CEO OF Facebook has explained why the company decided to make its users download its messaging app. Facebook Messenger became a mandatory download in July, much to the annoyance of its users. While it was effective, more than 500 million Android users downloaded the app, many were annoyed about Facebook directing it away from the main app and onto a different app. At a public Q&A session, Mark Zuckerberg explained the company’s thought process behind the decision, acknowledging that making people download an app was bound to annoy a lot of people. The first thing I want to do is acknowledge that asking everyone in our community to install another app, Messenger, is a big ask so I appreciate that that required work and [caused] a bunch of friction and I just wanted to acknowledge that up front. So why did they do it? The simple reason was it boils down to the entire experience and simplifying it for users. The reason why we wanted to do this is because we believe this is a better experience. We think that messaging is becoming increasingly important so on mobile, each app can focus on doing one thing well, we think, and the primary purpose of the Facebook app is News Feed.Messaging was this behaviour that people were doing more and more, there were 10 billion messages sent every day, but in order to get to your messages, you had to open the app, which would take a few seconds, and then go to a separate tap, and we saw that the top messaging apps people were using were these dedicated focused experiences. The continued focus on messaging apps and their growing importance meant it made more sense for the company to create an experience that plays to this strength instead of cluttering the main app with different actions. Even though it was a short-term, painful thing to ask folks to install a separate messaging app, we knew we could never deliver the quality or experience inside as just a tab in the main Facebook app… we needed to build a dedicated and focused experience. He also addressed the issue of why downloading it was mandatory instead of giving users a choice in the matter. One of the biggest challenges about building products at Facebook is we build for the whole community … The reason is that we’re trying to build an experience and a service that is good for everyone in the community, and one of the things that we found is because Messenger is faster and more focused, if you’re using it, you respond to messages faster. We realise that we have a lot to earn in terms of trust and proving that this standalone messenger experience is going to be really good, and we’re really committed to that and we have a team of our most talented people working on this. 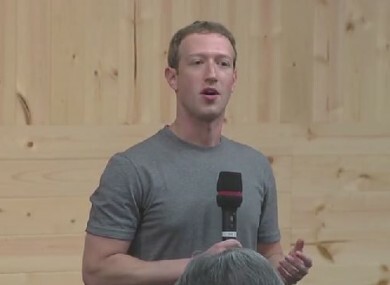 Zuckerberg covered a number of other topics during the hour-long Q&A. Among them was his feelings on the 2010 movie, The Social Network, which he said he found “hurtful”. The question of why he always wears a grey t-shirt no matter what he’s doing (he has more than one, thankfully). I’m in this really lucky position where I get to wake up every day and help serve more than one billion people, and I feel like I’m not doing my job if I spend any of my energy on things [that weren't important]. Even though it kind of sounds silly that that’s my reason for wearing a grey t-shirt every day, it’s also true. And in case you’re wondering, Facebook was never meant to be cool. Instead, his aim was to make Facebook a utility that always there for people to use and rely on. The entirety of Zuckerberg’s Q&A can be found here. Email “This is why you were forced to download Facebook Messenger”. Feedback on “This is why you were forced to download Facebook Messenger”.